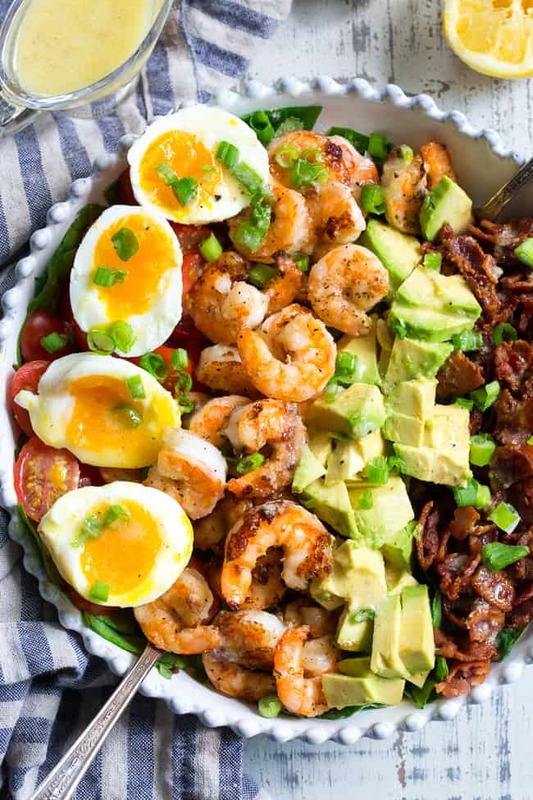 Perfectly seasoned grilled shrimp with crispy bacon, tomatoes, avocado and soft boiled eggs makes the best healthy, BBQ ready Cobb salad for summer! 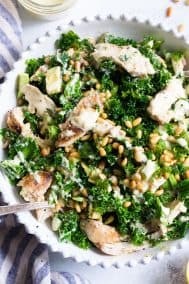 It’s tossed in an easy lemon garlic vinaigrette with your favorite salad greens for a flavor-packed low carb, Paleo, and Whole30 compliant meal. 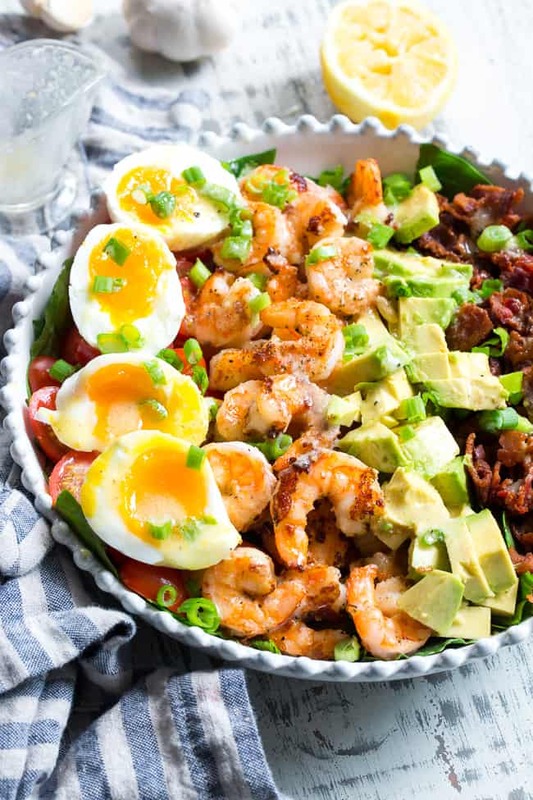 There’s something about a good cobb salad that always has me coming back. 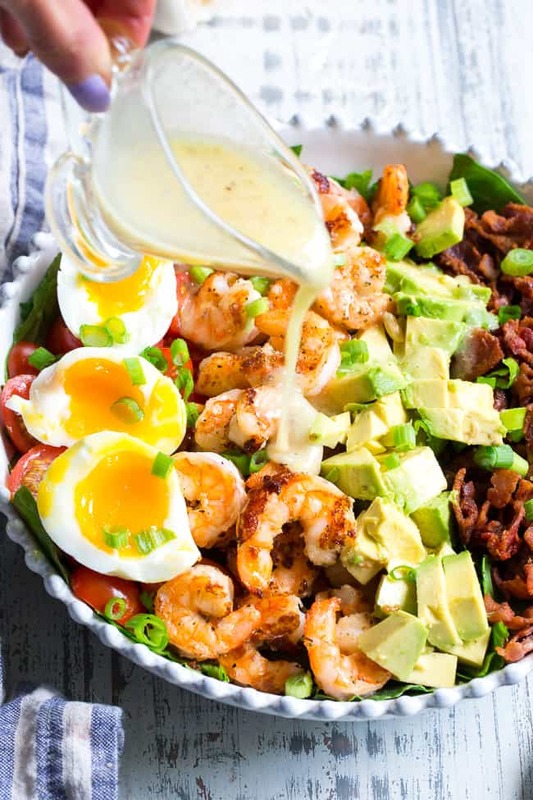 The bacon, the avocado, the eggs – no wonder it’s my go-to when it comes to salad – those are a few of my very favorite things! 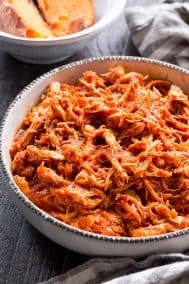 Typically it’s chicken that stars as the preferred protein in my cobb salads but I wanted something different this time to kick off summer and grilling season. So, grilled shrimp it is! And MAN – what a good choice it was. I (almost) forgot how dang tasty shrimp can be when paired with all these goodies! When it comes to flavor – more is always more in my book. Go big or go home, right?! So, with this salad there is just flavor all over the place. We season the shrimp with one of my very favorites – Primal Palate’s Seafood Seasoning – before grilling. You can also use your favorite seasoning blend or simple salt and pepper, but I highly recommend trying out this seasoning! And then of course, the dressing. 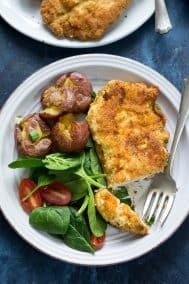 I wanted something light and fresh that wouldn’t overwhelm the entire salad, but yet still adds flavor to complement the other ingredients. So, I went with a super easy lemon garlic vinaigrette that could just wind up becoming your go-to salad dressing for summer. 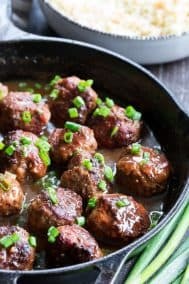 It add the perfect amount of everything to anything (in my opinion) and is also sugar free and Whole30 compliant. 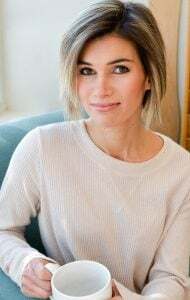 In order to blend up the salad dressing in literally 30 seconds flat, I used my Immersion Blender – which is perhaps my favorite and most-used kitchen tool. While the immersion blender not completely necessary to make the dressing, it DOES make it fool proof to get it perfectly thick and blended. Otherwise, you’ll have to add the olive oil slowly to the other ingredients while whisking or blending to get the emulsion to happen. 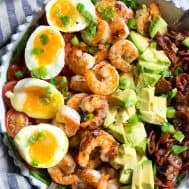 For that final touch of WOW – I decided to add perfectly “jammy” soft-boiled eggs to my cobb salad rather than the typical hardboiled ones. Soft boiled eggs are somewhat new to my egg-repertoire but once you start, it’s tough to stop! They’re super quick to make (just 8 minutes between the boiling and cooling) and the yolks have that just-gooey-enough yum factor that gets me every time! If you’re not a soft boiled fan, you can always hard boil the eggs and the salad will obviously be just as great, but if you’re curious to try something new, I definitely recommend giving the jammy eggs a try! 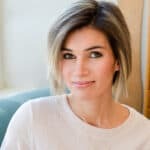 I hope you’re ready for a cobb salad full of summer fun and healthy goodies – let’s go! 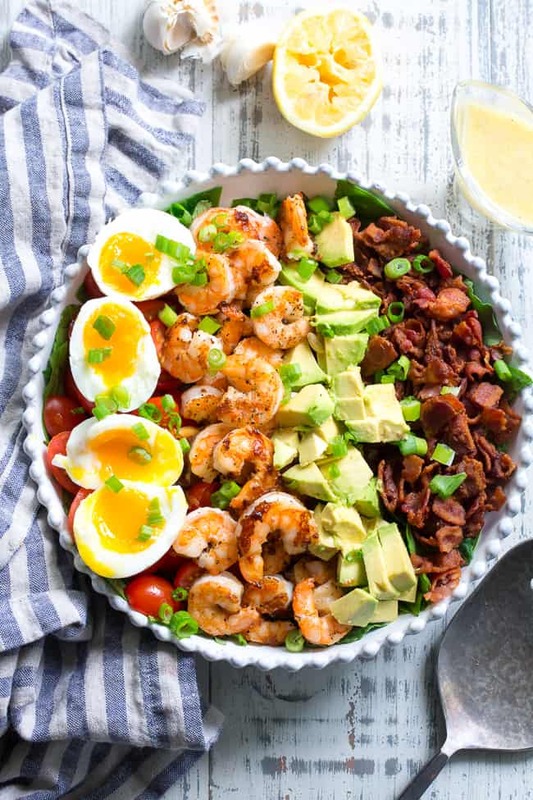 Perfectly seasoned grilled shrimp with crispy bacon, tomatoes, avocado and soft boiled eggs makes the best healthy, BBQ ready Cobb salad for summer! 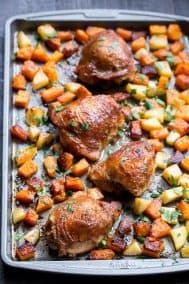 It's tossed in an easy lemon garlic vinaigrette with your favorite salad greens for a flavor-packed low carb, Paleo, and Whole30 compliant meal. 1/4 cup olive oil (use one you like the flavor of since it will come through! Place all ingredients in a tall narrow container and blend with an immersion blender. 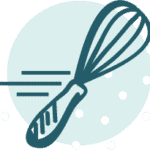 Alternatively, you can use a regular blender (or hand whisk) to combine all ingredients EXCEPT the oil, and then slowly stream in the oil while continuing to blend. The consistency should be somewhat thick and the color creamy. Bring a pot of water to boiling and prepare a bowl of ice water for after eggs cook. Carefully lower each egg into water. Boil eggs 6 minutes, adjusting heat to keep water at a medium boil. Remove eggs one at a time with a spoon and place in ice water for 2-3 minutes or until warm. Carefully peel eggs (I do this in the water, it seems to make it easier!) and set aside until ready to serve. Heat your grill or grill pan to high heat and brush with coconut oil. Sprinkle shrimp all over with primal palate seasoning or salt and pepper. Cook first side 2 minutes flip and continue to cook another 2-3 minutes or until pink and opaque with golden brown. 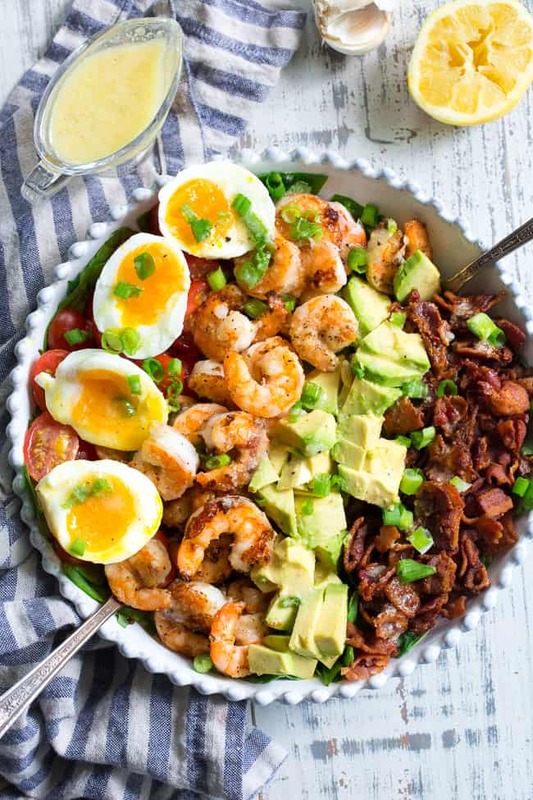 Place greens on the bottom of a serving bowl or platter, then arrange the tomatoes, bacon, shrimp, and avocado (diced or sliced) over the top. Carefully slice each egg and arrange around salad. 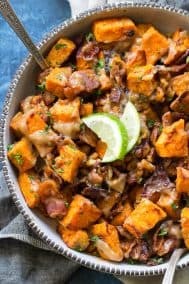 Toss with dressing immediately before serving or serve dressing on the side. Enjoy! 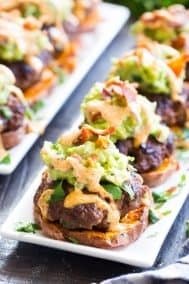 Want More Paleo and Whole30 Salad Recipes? Try One of These! 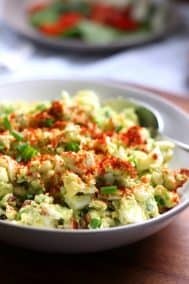 The dressing sounds yummy and easy to make! I’ll be trying it out soon. Would you happen to have the nutritional breakdown for just the dressing without the rest of the salad? Unfortunately I don’t have that breakdown since it takes into account all the ingredients I input. This salad was great! The shrimp was a new topping for us and was yumm-o. The dressing needed just a little more zip for my taste. Maybe a bit more lemon juice next time. But everyone liked it. Thanks! So delicious! Made this yesterday for lunch and my hubby said it was the best salad he’s ever had (homemade OR from a restaurant). I made a homemade whole30 compliant green goddess dressing with avocado in place of the vinaigrette and avocado chunks.